Ryoden Trading is a Tokyo Exchange listed Japanese manufacturing company that has two main product lines, FA Device Systems, and Semiconductors. The FA Device Systems is made up of controller systems, industrial mechatronics, and apparel manufacturing devices. Controllers are things such as sequencers and servos. Mechatronics is composed of robotics used in factory processes, an example of this might be a robot that puts a wheel on a car in an assembly line. The apparel manufacturing builds machines used in the manufacture of clothes in Asia. What's attractive to me about this company is that they are and have been profitable. 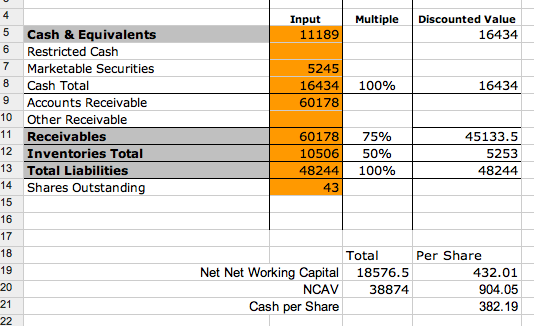 Investing in a company below NCAV while they are earning a profit ensures both a margin of safety and improves the chances that the company will pull through and realize it's intrinsic value. I should note, I used the FT.com balance sheet data for my worksheet, the actual balance sheet is available in Japanese and can be translated via Google Translate or a native speaker. -The company is trading at 503 which is slightly more than the 432 NWCC value and well below the NCAV of 904. -Profitable with earnings of ¥24.63 per share. -Management has set a goal of ¥240bn for fiscal 2012 with a 3% operating profile ratio (operating income). If management can execute at this level net income would be in the range of ¥4320bn or ¥100 EPS. -The company is trying to expand overseas, they plan on 20% of revenue being derived from overseas in the next year. Additionally they are opening a site in Germany in June due to increased demand from the Eurozone. -The company's earning power was significantly higher in the past, so expecting them to execute on their 2012 plan isn't unreasonable. -The company is debt free and cash flow positive. -The company only sustained minor damage in the earthquake. -The company has a nice website in English with summary results, and historical figures. -80% of their business comes from Japan which has a negative economic outlook. -The business only has a 3% operating margin, and a .63% net margin. -Shares need to be traded in 1k blocks, with an average volume of 32k, meaning an average of 32 trades take place a day, not very liquid. -Mitsubishi Electric Corp is a 37% owner of the company. -Japan is notorious for lack of shareholder activism, if investing in Ryoden don't expect a hedge fund to petition for a share buyback, or increased dividend. -The company experience a sharp drop off in earnings two years ago depressing the price. -The profit margin is pathetic, for every ¥1000 in sales they earn ¥6. In summary this is the type of net-net that offers good downside protection as well as the possibility of good returns. If management is able to increase earnings towards their goal of ¥100 EPS and using their last 5yr average P/E of 12.05 results in a ¥1205 share value or 139% higher than where it's at currently. In addition to this there is ¥382 in cash per share. The problem is there is no assurance the company will ever execute at that level, or that the market will recognize the results. Talk to Nate about this stock. Disclosure: I don't own any of the issues list in this post. The stock's valuation is interesting. I don't like the composition of its NCA though. 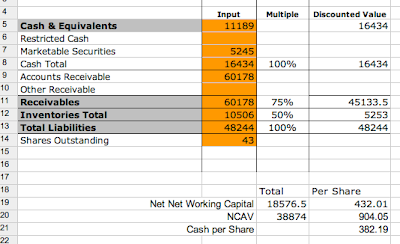 accounts receivables and less inventory build up. The inventory build-up in 2011 also explains why Operating CF is negative for this year. Earlier in the week when we had an amazing dinner, there was no mention of getting on tripadvisor and telling everyone how good the foot was. It is the same mindset with https://www.7binaryoptions.com/iqoption-review/ brokers. Helping you avoid the scam brokers and find the legit ones is why we created the trader driven https://www.7binaryoptions.com/iqoption-review/ Blacklist. We welcome you to our virtually ‘no holds barred’ ratings, comments and broker reviews website.